Mary Magdalene announcing the resurrection to the apostles (c. 1123). St. Albans Psalter, St Godehard’s Church, Hildesheim. 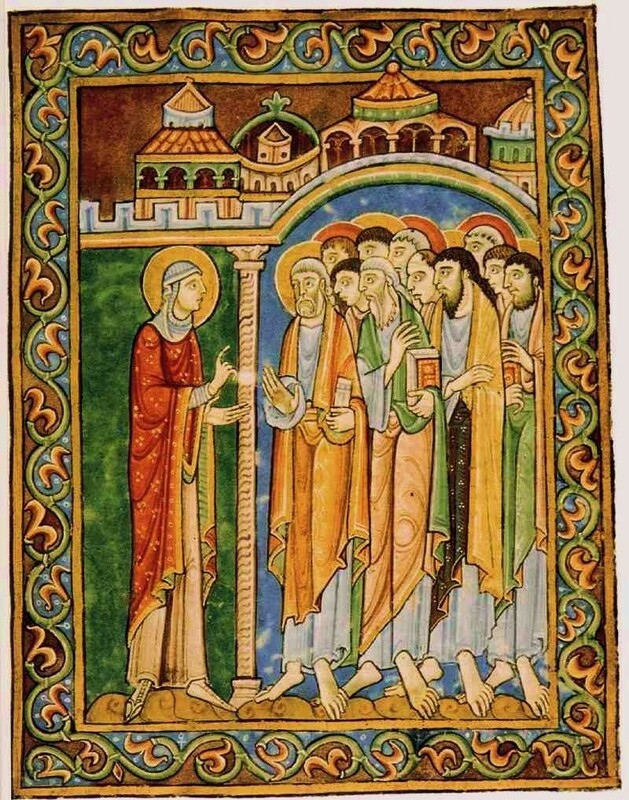 The Collect for today tells us that Mary Magdalene was “restored … to health of body and of mind” and “called to be a witness of [Jesus’] resurrection” (BCP 242). What does it mean to be a witness of the resurrection but simply to speak of Jesus’ living presence in your life? Mary Magdalene was the first to do that, telling the apostles that Jesus had risen and she had seen him. Each of us today is likewise to speak of what Jesus’ living presence means to us. How has Jesus’ presence restored you — rescued your life from death, your eyes from tears, your feet from stumbling? Follow Mary Magdalene’s example and speak simply about your walk in the presence of the Lord. This entry was posted in Daily Office and tagged Mary Magdalene, Morning Prayer, Psalm 116 on July 22, 2013 by Rodger Patience.